A new poll shows that some 78 percent of Chinese believe Western countries intend to contain China. Some 36.5 percent said the West intends to and have already moved to contain China. Some 41.7 percent say Western countries have such intentions but there exists no obvious action, according to a survey released by the Global Times’ Poll Center Tuesday. The annual survey, “How Chinese people view the world,” involved telephone responses from 1,530 people from seven Chinese cities, including Beijing, Shanghai, Guangzhou and Changsha. Jin Canrong, deputy dean of the School of International Studies at the Renmin University of China, told the Global Times on Tuesday that this is how the Chinese feel, following the past year’s events. Relations between China and the US have been strained in 2015 due to issues like the South China Sea disputes and cyber security. China and Japan locked horns in disputes around the Diaoyu Islands and Japan’s attitude to face up to its wartime history. “The US and Japan did things aimed at China, but China is not that easy to contain,” he said. 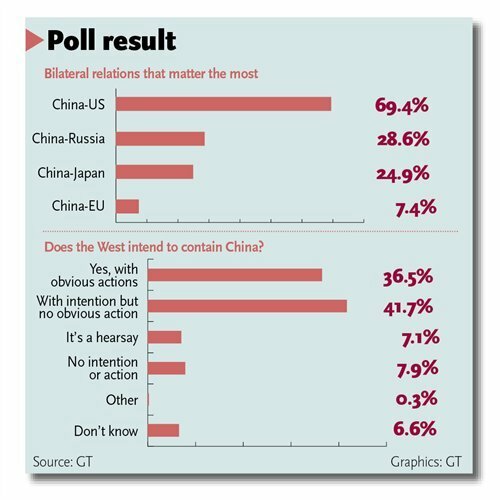 The poll also finds that some 69.4 percent consider Sino-US relations China’s most important bilateral relations. However, the number has dropped from 81.3 percent in 2009, 74.6 percent in 2012 and 72.3 percent in 2014. Bilateral relations with Russia, Japan, and the EU ranked as China’s second, third and fourth most important diplomatic relations. “It is no surprise to see Chinese pay more attention to Sino-US relations since it influences their lives as the two countries share common interests,” Jin said. The survey showed that 27.8 percent agree that the South China Sea disputes have been affecting relations, while 10.5 percent think the cyber security issue soured Sino-US relations. Other issues that may strain the Sino-US relations are the Taiwan issue, 22.6 percent, and the Diaoyu Islands, 22.1 percent. 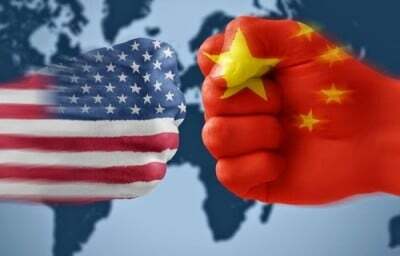 According to the survey, 56.9 percent, most of whom are young people, are optimistic about the future of Sino-US relations while 28.5 percent believe relations will be strained. Jin said that the positive views on the development of Sino-US relations reflect the respondents’ confidence in China. “The conflict between China and the US is more about national interests than ideology,” Zhang Jiehai, a sociologist at the Shanghai Academy of Social Sciences, told the Global Times. Meantime, 28.6 percent said bilateral relations with Russia are China’s second most important, and 24.9 percent said relations with Japan are the third most important. “Sino-Russian and Sino-Japanese relations are considered the most significant neighborly relations. China and Russia have been in recent years moving in a good direction, while Japan and China are still locked in feuds, including historical issues and disputes over the Diaoyu Islands,” Zhou Yongsheng, a professor at China Foreign Affairs University, told the Global Times. Zhou said that although Japan is China’s second largest trade partner, the disputes between the two countries involve national honor and interests, leaving most Chinese with little faith in the future of Sino-Japanese relations. People who think relations between China and Southeast Asian countries remain important to China dropped by 2.5 percent, compared to 2014. And 53.6 percent agree that disputes in the South China Sea were the main cause of strained relations. The survey also showed that 53.9 percent are optimistic about the future of China’s international relations, while 37.6 percent are concerned.